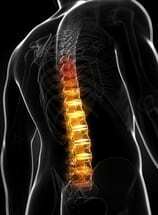 Spinal surgery carries certain risks, which, although rare, include spinal injury and nerve damage. To reduce these risks, intraoperative neurophysiological monitoring (IONM) is often used. IONM allows a surgeon to oversee how nerves are functioning throughout a surgical procedure. Using a range of techniques to evaluate muscle response and electrical activity from multiple muscles as a reaction to nerve stimulation, the equipment used in IONM obtains vital information from a patient's central nervous system throughout the surgery. Through sound or visual cues, IONM alerts a surgeon that a patient's nerve function may be compromised, which decreases the chances of irreversible neurological damage. IONM is employed to lower the risk of postoperative problems, including muscle weakness, paralysis and loss of sensation, due to neurological damage. Once the surgeon is notified by IONM of imminent damage to nerve tissue, correction can take place, resulting in a safer and more effective procedure. IONM is a significant improvement over earlier methods of protecting nerve function during complicated surgeries. Prior to IONM, a surgeon would use a clonus (wakeup) test during a procedure to check for nerve damage. For a procedure that would incorporate clonus tests, the patient would be given an anesthetic that quickly wore off. At various points during the surgery, the patient would be woken up, and asked to move certain parts of the body to test motor function. Even if a problem was discovered, it was sometimes too late to correct, resulting in permanent damage. Although usually employed during spinal surgery, IONM can be used in any type of surgery, including otolaryngological and urological, that can damage the nervous system. There are a variety of methods, depending on the type of surgery and other factors, employed by IONM. Two of the most common are described below. Somatosensory evoked potentials are used to analyze the conduction of impulses through the spinal cord. Electrodes are placed on parts of the body that might be neurologically affected during the procedure. The electrical activity is recorded on the IONM device. Electromyography evaluates the health of the muscles, and the nerves that control them, by measuring muscles' electrical activity. Thin-needle electrodes are inserted through the skin and into the muscle, where they detect and report on electrical activity. According to the website of the American Society of Neurophysiological Monitoring, IONM team members include "technologists, surgeons, nurses, anesthesiologists, neurophysiologists . . ." and a team supervisor.